The UC Hopland Research & Extension Center is blessed to be located in a "melting pot" of microclimate regions and soil types thus resulting in a high diversity of vascular plant occurrence. On the Center there can be found eleven oak species of the genus Quercus. The Canyon Live Oak (Quercus chrysolepis) is an evergreen oak species within that group, and this year the acorn crop appears to be abundant for this species. Other common names are canyon oak, maul oak, goldcup oak, gold cup live oak, and gold cup oak. This species of oak is confined to western North America, primarily California where it is found in all but seven counties. It is quite adaptable growing from sea level to 6500 feet elevation. it is tolerant of a wide variety of soil types, is hardy down to -11 degrees F., and grows in neutral to moderately acidic soils with pH ranges of 4.5 to 7.5. 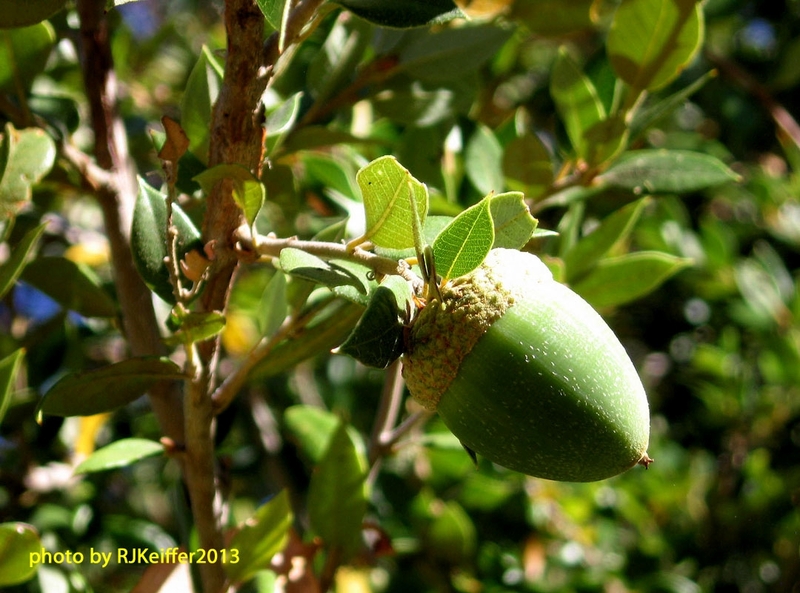 A fairly recent study shows that in low light environments the Canyon Live Oak out-competes species with superior leaf size and crown mass per unit volume due to the species' greater photosynthetic efficiency and leaf lifespan.